Take Exit 5 Falls Road toward Rockville. If you are on I-270 North, bear right off the exit ramp, heading towards downtown Rockville. If you are on I-270 South, bear left off the ramp towards Rockville. The road becomes Maryland Avenue; stay in the left lane. Proceed straight through two traffic lights and follow across E. Jefferson Street (Route 28). Maryland Avenue entrance of the courthouse will be on your right. If you are on Route 355 South on Hungerford Drive, turn right onto Monroe Place. Proceed across Monroe Street to Monroe Street entrance of the courthouse. If you are on Route 355 North on Rockville Pike, stay in the left lane and turn left onto Jefferson Street (Route 28). Stay in the right lane and make right turn onto Maryland Avenue. Maryland Avenue entrance of the courthouse will be on your right. 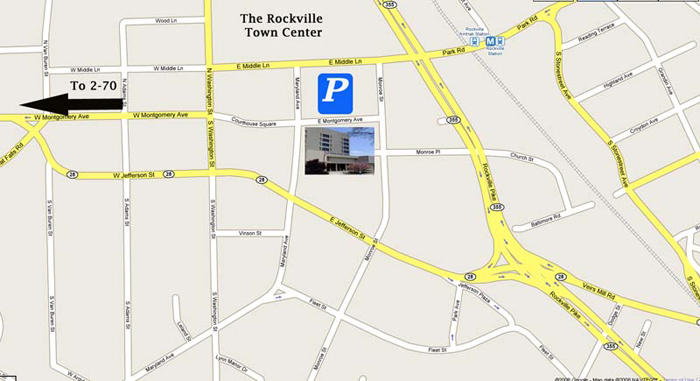 Paid parking is available to the public in downtown Rockville, including surface parking across from the theaters and restaurants between Middle Lane and West Montgomery Avenue (entrance is on Middle Lane), at the corner of Middle Lane and Hungerford Drive (entrance is on Middle Lane), and at the corner of South Washington and Jefferson Streets (accessible from both streets). Public garage parking is available at 51 Monroe Street (entrance is on Monroe Place), at 255 Rockville Pike (entrance is on Rockville Pike and Monroe Street), at the Court Square Building (entrance is on Middle Lane), the Rockville Town Square Buildings (2 different locations on Middle Lane and Maryland Avenue), and at the Council Office Building (COB) garage at the corner of Jefferson and Monroe Streets (accessible from both streets). Parking fares range from $1.00 to $3.00/hour up to 3-5 hours; over 5 hours a flat rate of $7.50 - $9.00 applies. Street metered parking is also available around the courthouse. Please note that the parking meters take only quarters (15 min. per quarter) up to a maximum of 2 hours. Take the Red Line towards Shady Grove (if you are coming from Washington, D.C. or Virginia) or towards Glenmont or Silver Spring (if you are coming from north of Rockville) and get off at the Rockville Station. Turn left after the turnstiles and go up and over Hungerford Drive (Route 355) on the pedestrian bridge. Walk across the pedestrian bridge until you reach Monroe Street. Turn left on Monroe Street. The courthouse is on your right about a quarter of a block. Take elevator or escalator to the Register of Wills on the 3rd floor, room 322. Ride On Bus Routes 44-49, 52, 54-56, 59, 63, and 81 provide stops on Monroe Street near the courthouse and/or at the Rockville Metrorail Station. Please note that when entering your address above, directions will be provided to the Judicial Center building located at 50 Maryland Avenue, Rockville, Maryland 20850.